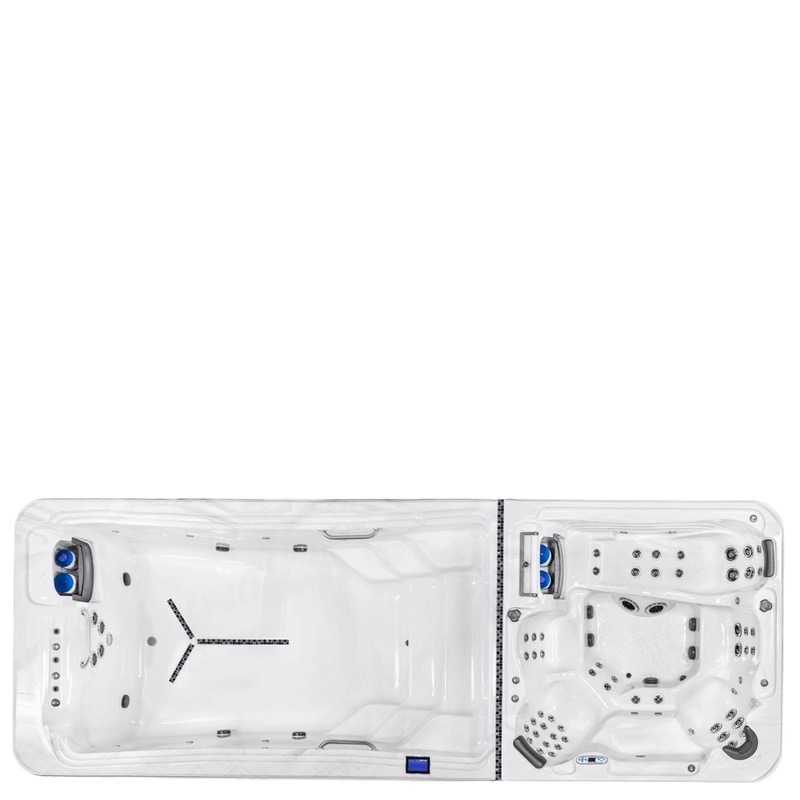 Standard features on TidalFit® exercise pools include a waterfall, special micron filters, exercise equipment and more. Hydrotherapy options soothe sore muscles after your workout and LED lighting and sound systems provide entertainment and relaxation. 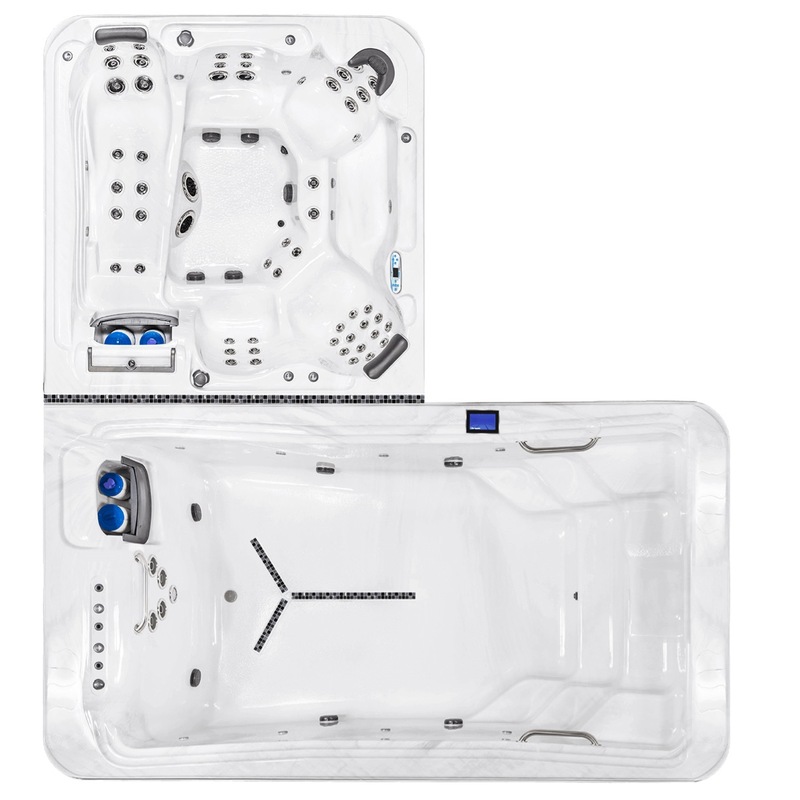 The TidalFit exercise pool is built to the same world class quality standards that you would expect from May Manufacturing, LLC, who is renowned throughout the spa industry. Designed with an ideal combination of innovative engineering and artistry, the TidalFit is as constant in quality as it is in efficiency and design. TidalFit was recently seen on the ABC television show Extreme Makeover Weight Loss Edition. 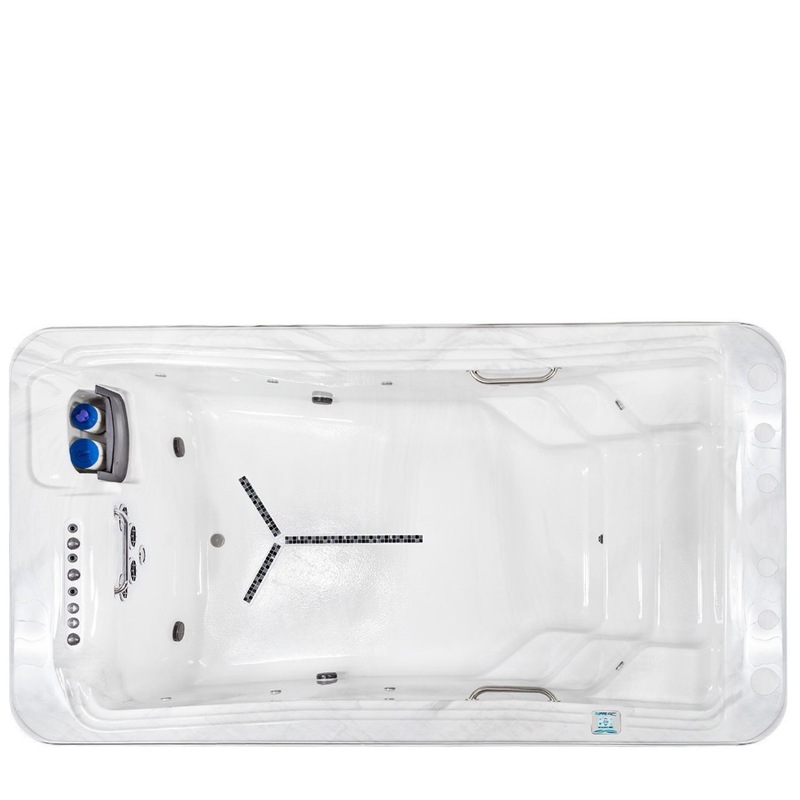 With this deluxe cover, your pool will stay protected and well insulated to keep in the heat. This sleek LCD back-lit display controls multiple functions in 4 different languages. The Pro EP-15 & PowerPlus EP-16 come standard with a dual 9 in. waterfall. These cabinets are beautiful, long-lasting Kingwood that adds years of maintenance-free life to your spa. These rails offer extra stability when exercising and stretching. Every TidalFit comes with a standard heater to warm your pool to the perfect temperature in any climate. TidalFit models come standard with full foam insulation and an ABS bottom to protect against environmental elements. (ProPlus EP-16 is equipped with full foam and a metal frame). This 5 in. spa light illuminates your pool during dark hours. Hi-Flo circulation keeps your water circulating efficiently and helps your pool stay clean. 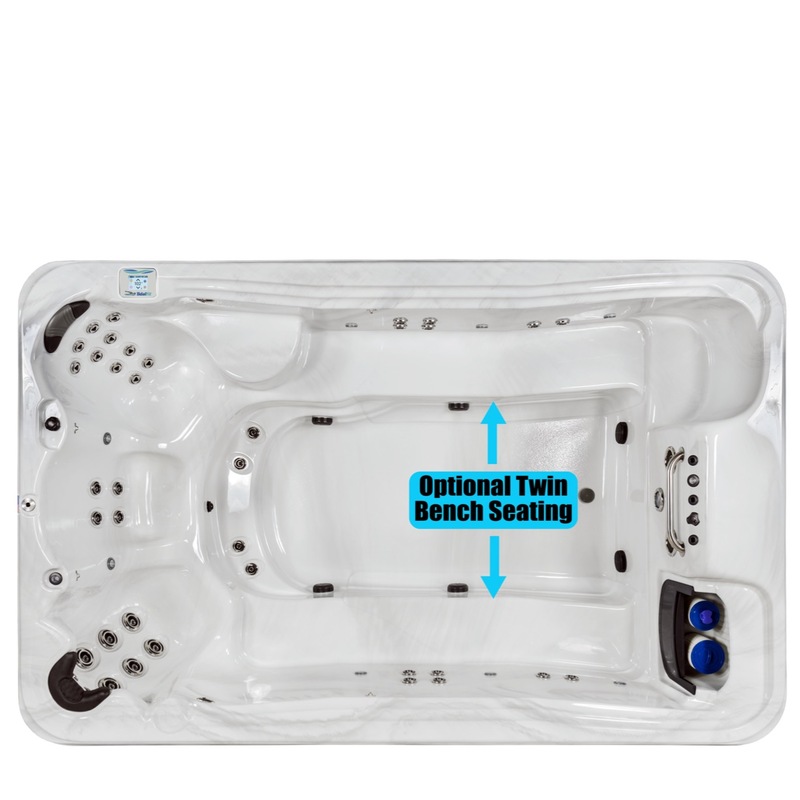 TidalFit models have their own unique swim jets system. See all three jet systems here. 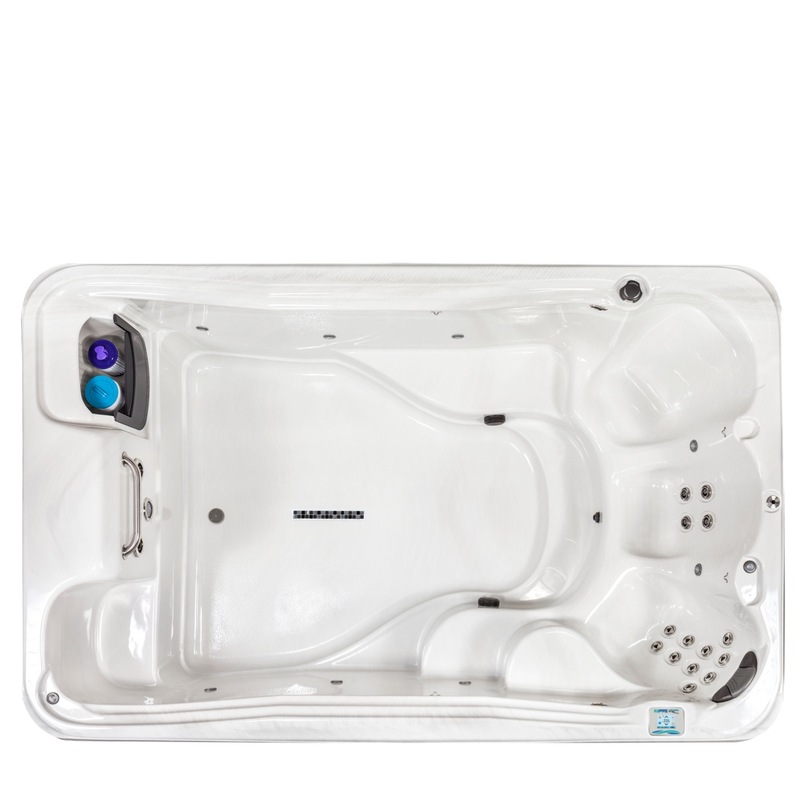 Every model offers the Hydrotherapy option to soothe aching muscles and help with relaxation. 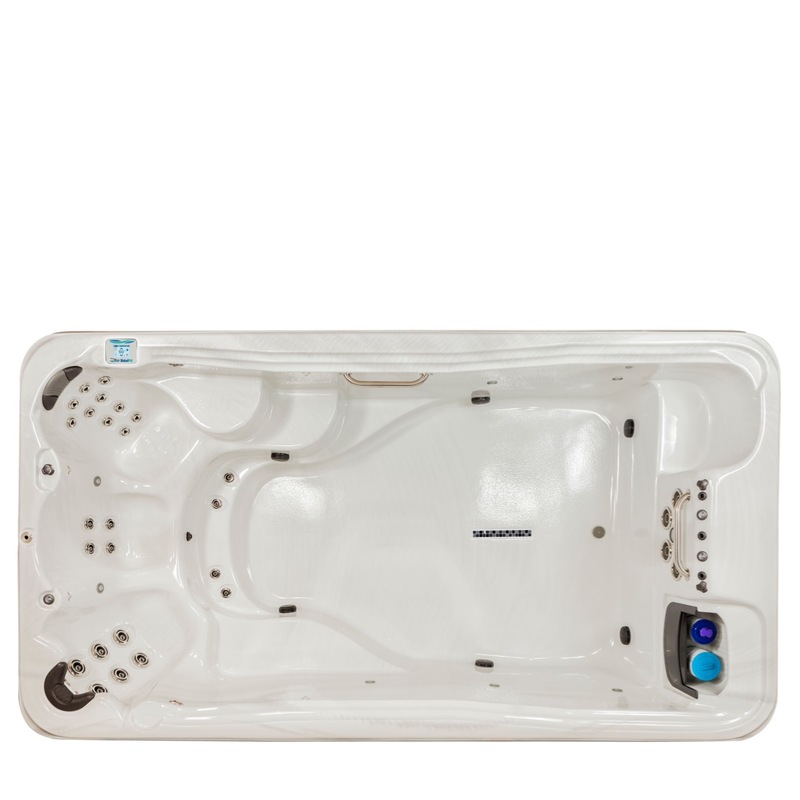 This innovative technology provides each user individual hydrotherapy control. Whether you choose to add an Ozonator, Crystal AOP or Crystal ProPure each promotes water purification for a clean pool. Javastone and Sandstone cabinets are available on semi in-ground models. The VacuSeal lifter allows you to easily open and close this outward opening cover, giving you additional privacy. This insulated cover seals to the exercise pool to keep in heat and reduces energy costs. Select from several options to add a lighted ambiance to your pool. 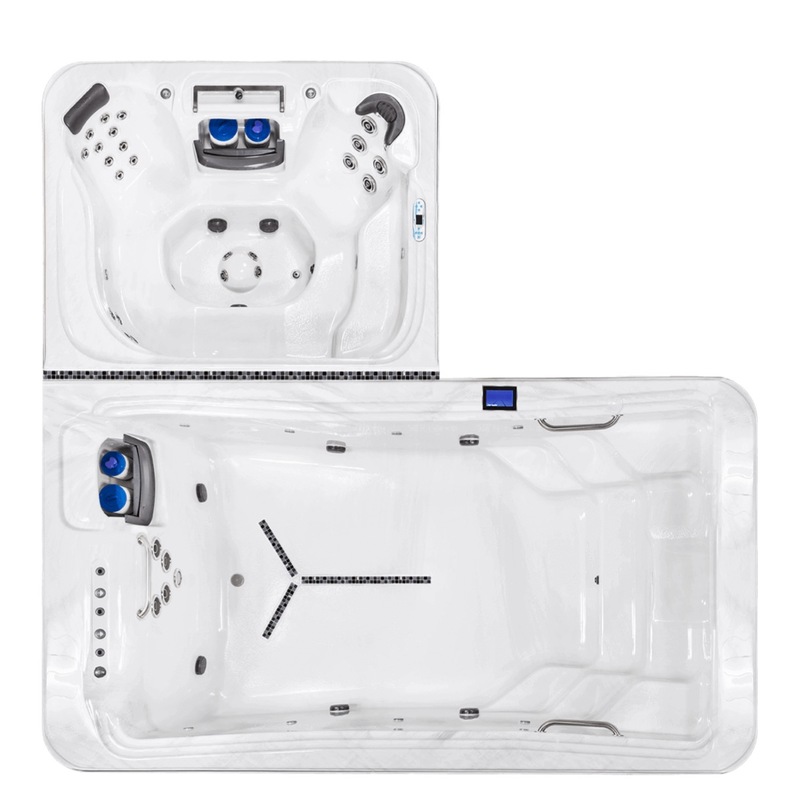 Complete your pool experience with the fully integrated bba™, Bluetooth Audio System or the Bluetooth Music Experience. Control your pool temperature, filter cycle, turn on pumps and much more. Maximize your workout in your exercise pool you can choose between the Stationary Resistant Swim and/or the Rowing Bars and Resistant Cords. The eloquent BellagioFall is a beautiful accent that can be added to the ActivePlus EP-12 or Premium EP-14. With this option you can place your pool into the ground making for creative deck and patio installations. Hydrotherapy is more than a method of relieving stress. It can relieve high blood pressure, headaches and chronic pain. It benefits every part of the body, including the skeletal, respiratory, circulatory, neuromuscular and digestive systems. Stay heart healthy with a regular exercise program. In water your body is weightless and doesn’t put weight on your joints like other cardio activities. This makes swimming an ideal way to exercise if you are recovering from an injury or have joints problems. 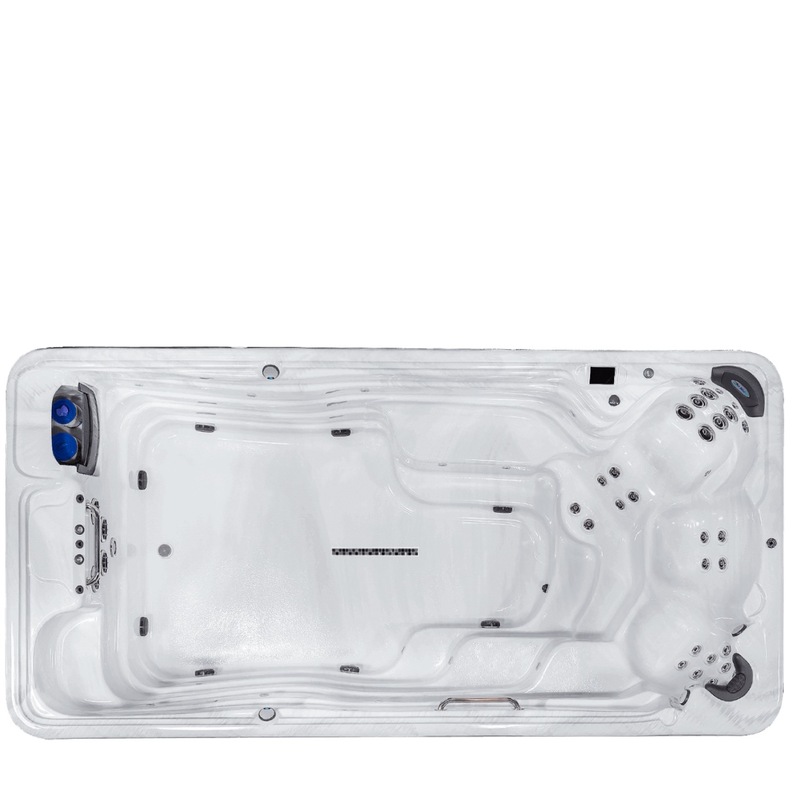 The circulation of water and warmth of a TidalFit Exercise Pool encourages the body to unwind and relax on its own and can help lead to a more restful sleep. Massage also has been shown to improve flexibility, increase circulation and provide restorative benefits. Everyone can enjoy the TidalFit no matter if you are a beginner or advanced swimmer. Swim jets can be adjusted to a lower current for the beginner learning to swim. Or adjust for a more powerful current for the advanced swimmer to get the workout they desire. Let the kids swim and play while you enjoy a hydrotherapy massage. 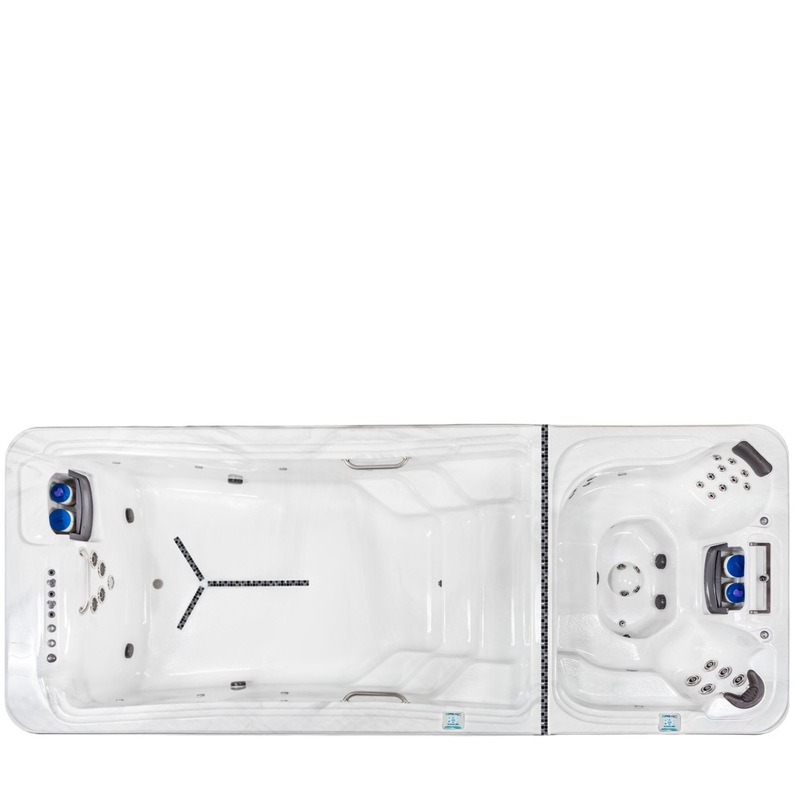 TidalFit provides ample room for swimming and hydrotherapy seats for relaxation.